Deborah Crombie returns with style in her 14th Duncan Kincaid/Gemma Kincaid mystery. 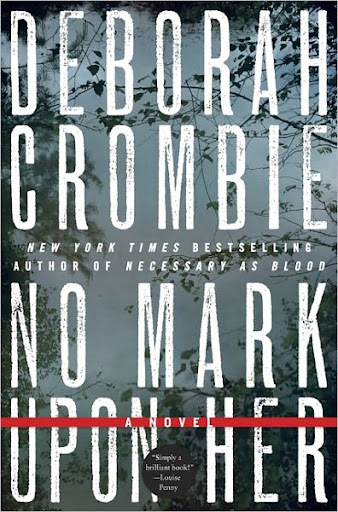 Don’t fret if you aren’t up to date or haven’t heard of this series — Crombie displays an impressive ability to write to both her longtime fans and new readers in No Mark Upon Her. Atmospheric, chilling and entirely gripping, we stayed up late into the night as we raced through its twists and turns, which is why it’s our Red Hot Book of the Week. Mysteries are very hot right now, especially those of the Scandinavian variety. Therefore, in many ways, No Mark Upon Her is like a breath of fresh, yet familiar (albeit foggy) air, from behind which a murderer lurks. Set surrounding the moody Thames River, this is a perfectly atmospheric British procedural mystery, centering around Scotland Yard Detective Duncan Kincaid. We couldn’t get enough of the murkiness of this novel, especially because the plot was so fast-paced and intriguing. Duncan Kincaid is about to face something much more daunting than his normal job as a Scotland Yard detective. After adopting a child, he and wife Gemma James have decided that, for the time being, one of them should stay home with her while their new daughter adjusted to the family. Gemma’s time is just about up, and Duncan is facing a long leave from work to spend at home with his children. But right before his leave, something comes up — the body of a rower, found in a boat on the Thames. But this wasn’t just any rower. Rebecca Meredith was secretly in training for the Olympics, and she wasn’t amateur enough to make a mistake that would cause her death. However, when Duncan discovers that Rebecca was also a detective with the Met in London, the case takes on a whole different meaning. All of a sudden, he’s fighting superiors and uncovering disturbing information that could implicate people within the police in Rebecca’s death. But Rebecca is one of their own, and Duncan is determined to bring her justice. As Duncan continues down this difficult path, he finds all kinds of secrets under the surface in Rebecca’s life. As the plot accelerates, Duncan must make some difficult choices, especially when it starts to look as if he may be putting his career in jeopardy with his dogged pursuit of Rebecca’s killer. As the number of suspects continues to rise, and motives appear to be everywhere, Duncan must use all his wits and resources (including Gemma) to discover the truth behind Rebecca’s murder.